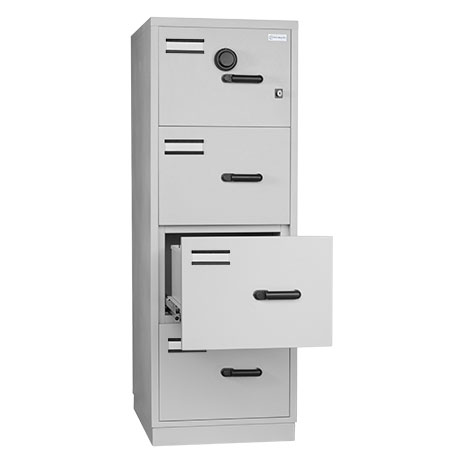 Highly-reliable document protection for your company’s most vital documents: FCR Ultime 31 is a range of filing cabinets that are certified to provide fire protection for up to one or to two hours, as well as impact absorption in the event of a floor collapse in a building fire​. Your contracts, insurance documents and archives are of vital importance for your company. As a results you want to protect them from both heat and flames. But even more you wish them to also be preserved in case the ground collapses following the fire event. FCR Ultime 31 is designed to protect your documents with maximum capacity. The range is available in two-, three or four- drawer models with fire protection for up to two hours certified by UL (Underwriter’s Laboratories)according to Standard 72 Class 350. Because of its light-weight construction, you can easily place the cabinet in any user environment. Should the building floor collapse during the fire event, the contents still remain protected.